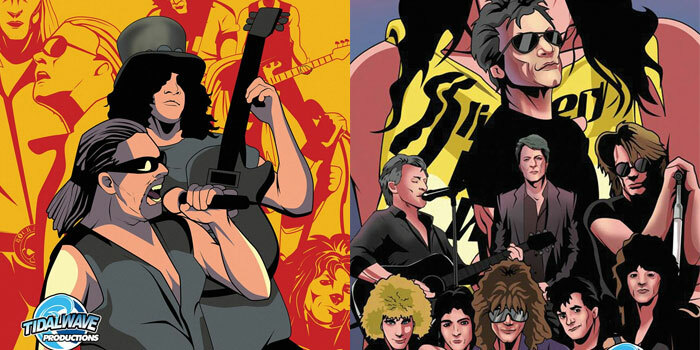 The exciting histories of Guns N’ Roses and Bon Jovi have been turned into two dynamic comic books via TidalWave Comics. “Orbit: Guns N’ Roses” and “Orbit: Bon Jovi” are both available via digital e-readers and in print at Amazon. In “Orbit: Guns N’ Roses,” read about how the “most dangerous band in the world” rode a wave of fame and fortune during the heyday of MTV. Camera-ready, their creativity fueled by drugs, booze, and eager groupies, members like Axl Rose and Slash crafted music that permeated the airwaves. Gun N’ Roses transcended their metal roots to become genuine chart-toppers. This comic book explores their meteoric rise and dramatic fall. “Orbit: Bon Jovi” is a sequel to the sold-out “Fame: Bon Jovi,” which was featured in Rolling Stone, People, and Time magazines. The “Orbit” comic explores the myth behind the band, their creative impulses, and drive to be fulfilled artistically. A humanitarian and philanthropist, lead singer Jon kept the band on the charts for decades, landing them a coveted spot in the Rock and Roll Hall of Fame. “Fame: Bon Jovi” is back in print in a special hardback edition. Written by Michael L. Frizell and art by Jayfri Hashim, “Orbit: Guns N’ Roses” features a special cover by famed album artist David Frizell and a regular cover by Hashim. “Orbit: Bon Jovi” also features two collectible covers, both by Hashim, who also wrote the outline for the comic with an assist from Frizell. The biography comic form allows TidalWave’s talented writers to delve into the history of newsworthy figures and explore the events that shaped them. TidalWave has published well-received biographies of other musicians, John Lennon, George Harrison, Whitney Houston, Amy Winehouse, Kurt Cobain, Jerry Garcia and more. Their line of biographical comic books has been featured on CNN, USA Entertainment Weekly, Rolling Stone, Billboard, Vanity Fair, The Today Show, FOX News, and in People Magazine among thousands of others, engaging readers of all ages with a mix of information and entertainment.